Citation Information: JCI Insight. 2019;4(7):e125527. https://doi.org/10.1172/jci.insight.125527. Heart failure (HF) is associated in humans and mice with increased circulating levels of CXCL9 and CXCL10, chemokine ligands of the CXCR3 receptor, predominantly expressed on CD4+ Th1 cells. Chemokine engagement of receptors is required for T cell integrin activation and recruitment to sites of inflammation. Th1 cells drive adverse cardiac remodeling in pressure overload–induced cardiac dysfunction, and mice lacking the integrin ligand ICAM-1 show defective T cell recruitment to the heart. Here, we show that CXCR3+ T cells infiltrate the heart in humans and mice with pressure overload–induced cardiac dysfunction. Genetic deletion of CXCR3 disrupts CD4+ T cell heart infiltration and prevents adverse cardiac remodeling. 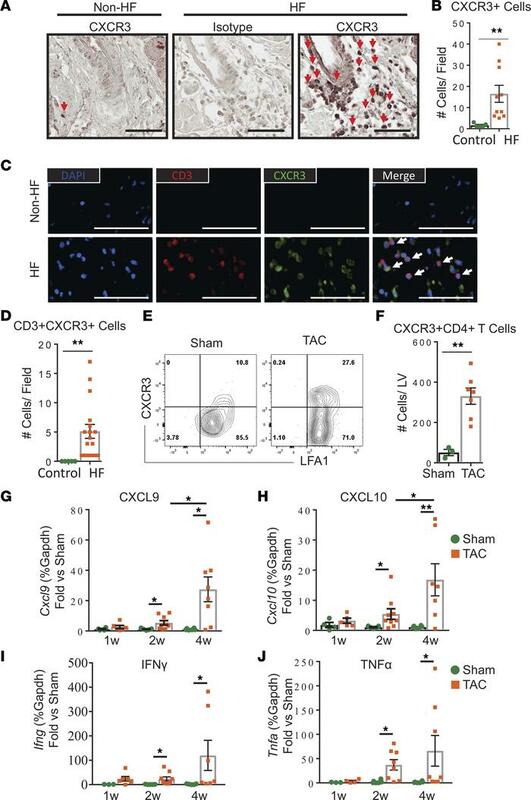 We demonstrate that cardiac fibroblasts and cardiac myeloid cells that include resident and infiltrated macrophages are the source of CXCL9 and CXCL10, which mechanistically promote Th1 cell adhesion to ICAM-1 under shear conditions in a CXCR3-dependent manner. To our knowledge, our findings identify a previously unrecognized role for CXCR3 in Th1 cell recruitment into the heart in pressure overload–induced cardiac dysfunction. CXCR3+ T cell infiltration in humans and mice with cardiac pressure overload. (A and B) LV tissue sections from non-HF or nonischemic HF human subjects were stained for CXCR3 or isotype control by IHC (representative CXCR3+ leukocyte–shaped cells are indicated with red arrows) (A) and quantified in multiple fields of view using a 40× objective (B). (C and D) LV tissue sections were stained for DAPI (blue), CD3 (red), and CXCR3 (green) by immunofluorescence (C), and the number of cells showing colocalization were quantified in multiple fields of view per section using a 40× objective (D). Scale bar: 100 μm. n = 2 control, 3 HF. Error bars represent mean ± SEM (**P < 0.01; Mann-Whitney unpaired U test). (E and F) CD4+ T cells isolated from the LV tissue of mice 4 weeks after Sham or TAC surgery were analyzed (E) and quantified (F) for surface CXCR3 and LFA-1 expression within the CD4+ gate by flow cytometry. n = 3 Sham, 7 TAC. Error bars represent mean ± SEM (**P < 0.01; Mann-Whitney unpaired U test). (G–J) Chemokine and cytokine mRNA levels in the LV of WT mice at different time points after surgery were determined by qPCR for Cxcl9 (G), Cxcl10 (H), Ifng (I), and Tnfa (J). n = 4 Sham, 5 TAC 1 weeks (w); 5 Sham, 9 TAC 2w; 6 Sham, 8 TAC 4w. Error bars represent mean ± SEM (*P < 0.05, **P < 0.01; 1-way ANOVA with Bonferroni post hoc test).